For other uses, see A Train. The A Eighth Avenue Express is a rapid transit service in the B Division of the New York City Subway. Its route emblem, or "bullet", is colored blue since it uses the IND Eighth Avenue Line in Manhattan. The A provides the longest one-seat ride in the system—at 32.39 miles (52.13 km), between Inwood and Far Rockaway—and has a weekday ridership of 600,000. The A was extended to Jay Street–Borough Hall on February 1, 1933, when the Cranberry Street Tunnel to Brooklyn opened, and to Bergen Street, when the extension opened on March 20. On July 1, the A began running express at all times, stopping at 155th Street and 163rd Street during late nights. :82 The A was extended to Church Avenue on October 7. On April 9, 1936, the IND Fulton Street Line was opened to Rockaway Avenue. The 1936 extension played an integral part in the establishment of Bedford-Stuyvesant as Brooklyn's central African American community. The A train connected Harlem, Manhattan's central African American community, to areas of Bedford-Stuyvesant that provided residential opportunities for African Americans not found throughout the rest of New York City. On October 24, 1949, express service in Brooklyn to Broadway–East New York began with the A running express during rush hours, with the E extended to provide local service. On April 29, 1956, Grant Avenue was opened, and the line was extended over the BMT Fulton Street Line to Lefferts Boulevard. On weekdays except midnights, alternate trains terminated at Lefferts Boulevard and at Euclid Avenue. During weekends, they terminated at Euclid Avenue with a shuttle to Lefferts Boulevard. Two months later, on June 28, 1956, the former Long Island Rail Road Rockaway Line was rebuilt to subway specifications, and service began to Rockaway Park and Wavecrest (Beach 25th Street). At this time, rush hour express service on the Fulton Street Line with the E train began. On September 16, 1956, the A was extended to the Rockaways, replacing the E. At the time, alternate trains continued running to Lefferts Boulevard. On January 27, 1957, non-rush hour through service to the Rockaways was discontinued and was replaced by a shuttle running between Euclid Avenue and Wavecrest (now Beach 25th Street). Non-rush hour A train service was now to Lefferts Boulevard. This may also be the time that the E replaced the A again in the Rockaways. On January 16, 1958, a new terminal was opened at Far Rockaway–Mott Avenue, and the through connection to the Long Island Rail Road's Far Rockaway station was severed. On September 8, 1958, the A train replaced the E train in the Rockaways again. "Round-robin" service from Euclid Avenue to both Rockaway terminals began, non-rush hours, while through A service ran to Lefferts Boulevard. In September 1959, the A began to run local in Brooklyn at all times, as the E became express in Brooklyn. In 1963, the E train was extended to the Rockaways, and the A train ran local to Euclid Avenue or Lefferts Boulevard at all times. (HH shuttle service from Euclid Avenue provided all service to the Rockaways). On July 9, 1967, the A train was extended to Far Rockaway middays, evenings, and weekends, replacing the HH shuttle on that branch. Five years later, it was also extended during rush hours. On January 2, 1973, the A train became the express service along Fulton Street and the E train became the local during rush hours. Finally, on August 30, 1976, the C became the Fulton Street Local during rush hours. On August 27, 1977, the A began making local stops in Manhattan during late nights, when the AA was not running. On December 11, 1988, A trains began running local between 145th Street and 168th Street on weekends to replace the discontinued K service, and express on the IND Fulton Street Line in Brooklyn during middays and rush hours, with the C providing local service during those times. On September 30, 1990, A trains began operating local between 145th Street and 168th Street during weekday evenings. Until October 23, 1992, the A train ran to Lefferts Boulevard during late nights while the Far Rockaway section was served by a shuttle to Euclid Avenue. On that date this pattern was switched, with late-night A service running to Far Rockaway. Since then an A shuttle provided service from Euclid Avenue to Lefferts Boulevard during late nights. In addition, special A service began running from Rockaway Park to 59th Street–Columbus Circle (Dyckman Street and Inwood–207th Street in the future) during the morning rush and from 59th Street–Columbus Circle to Rockaway Park during the evening rush. On May 29, 1994, A trains began running express during between 7 a.m. and 11 p.m. between 145th Street, with C trains making local stops. On May 2, 1999, the A became the express on the Fulton Street Line at all times except late nights, after all C service was moved from World Trade Center to Euclid Avenue. On January 23, 2005, a fire at the Chambers Street signal room crippled A and C service. Initial assessments suggested that it would take several years to restore normal service, but the damaged equipment was replaced with available spare parts, and normal service resumed on April 21. A service was affected by Hurricane Sandy in October 2012, due to extreme damage to the IND Rockaway Line. Trains that normally traveled to Far Rockaway or Rockaway Park terminated at Howard Beach–JFK Airport. Service to the Rockaways resumed on May 30, 2013. 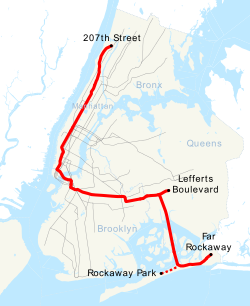 The Far Rockaway part of the route was served by the temporary free H shuttle that ran between Far Rockaway and Beach 90th Street via the connecting track at Hammels Wye. As a result of a two-phase program of flood mitigation work along the Hammels Wye, between April 9 and May 18, 2018, limited rush hour A service to/from Rockaway Park was suspended. [b] The second phase, from July 1 to September 3, diverted all Far Rockaway-bound A trips to Rockaway Park, with Rockaway Park Shuttle trains being rerouted to the Far Rockaway branch through the southern leg of Hammels Wye. For clarity, the A's branches are shown separately in the following table. The leftmost column shows the Lefferts Boulevard service; the second column shows the Far Rockaway service; and the third column shows the Rockaway Park service. (IND Queens Boulevard Line) Station is ADA-accessible in the southbound direction only. "Take the 'A' Train" is a jazz standard by Billy Strayhorn, referring to the A train, going at that time from eastern Brooklyn up into Harlem and northern Manhattan, using the express tracks in Manhattan. It became the signature tune of Duke Ellington and often opened the shows of Ella Fitzgerald. Part of the significance of this is sociological; it connected Harlem and Bedford–Stuyvesant, the two largest African-American neighborhoods in New York City. ^ Limited rush-hour service that normally begins or ends at Rockaway Park will begin or end at Euclid Avenue instead. ^ There are several local A trains each late evening and early mornings which travel to and from Lefferts Boulevard. ^ a b "A Subway Timetable, Effective November 4, 2018" (PDF). Metropolitan Transportation Authority. Retrieved February 28, 2019. ^ "mta.info - Line Colors". mta.info. ^ a b "Review of the A and C Lines" (PDF). Metropolitan Transportation Authority. December 11, 2015. Retrieved January 19, 2016. ^ a b c Cunningham, Joseph; DeHart, Leonard O. (1993). A History of the New York City Subway System. J. Schmidt, R. Giglio, and K. Lang. ^ "CITY OPENS SUBWAY TO BROOKLYN TODAY; Regular Express Service on the Extension of Independent Line Starts at 6:05 A.M. 3 LARGE STATIONS ADDED Fast Trains to Make Run From 207th St. to Borough Hall in 37 Minutes. 43 MORE MEN ON JOBS Officials Look for Rise in income as Financial District Is Brought Into New Route". The New York Times. February 1, 1933. ISSN 0362-4331. Retrieved June 20, 2016. ^ "NEW SUBWAY LINK OPENS WEDNESDAY; Independent Line Will Offer Express Service to Borough Hall in Brooklyn. KEY STATION TO BE ADDED Broadway-Nassau St. Platform to Connect With B.M.T. and East and West Side I.R.T. ADDED REVENUE EXPECTED 2-Way Rush-Hour Traffic Hoped For by Officials -- Local Trains to Be Speeded Slightly". The New York Times. January 29, 1933. ISSN 0362-4331. Retrieved June 20, 2016. ^ "CITY SUBWAY OPENS NEW LINK MARCH 20; Brooklyn Extension to Bergen and Smith Streets to Add One More Station. RISE IN REVENUE CERTAIN Further Cut Into Traffic of Rival Systems at Terminal Point Is Predicted. GROWTH WILL CONTINUE Station-by-Siation Completion to Church Avenue Before September Is Planned". The New York Times. March 12, 1933. ISSN 0362-4331. Retrieved June 20, 2016. ^ a b c d e "NYCT Line by Line History". erictb.info. ^ "NEW SUBWAY LINK OPENED BY MAYOR; He Tells 15,000 in Brooklyn It Will Be Extended to Queens When Red Tape Is Cut". The New York Times. April 9, 1936. ISSN 0362-4331. Retrieved April 25, 2018. ^ Echanove, Matias. "Bed-Stuy on the Move". Master thesis. Urban Planning Program. Columbia University. Urbanology.org. 2003. ^ Williams, Keith. "Weaving the Broadway Junction tapestry". The Weekly Nabe. Retrieved August 6, 2012. ^ "IND Faster Service Will Start Sunday" (PDF). The New York Times. October 20, 1949. Retrieved February 20, 2016. ^ "First Leg of Rockaways Transit Opened at Cost of $10,154,702; Station and Subway Section Put Into Use--Service Is Expected on June 28". The New York Times. April 30, 1956. ISSN 0362-4331. Retrieved June 20, 2016. ^ "LONG ISLAND STATION HISTORY". trainsarefun.com. Archived from the original on May 26, 2017. Retrieved May 6, 2014. ^ Freejman), Ira Henry (June 29, 1956). "FREE RIDE OPENS ROCKAWAYS LINE; Fete Marks Longest Single Extension of Rapid Transit in History of the City Commissioner's Children Help Mayor Arrives Late". The New York Times. ISSN 0362-4331. Retrieved June 20, 2016. ^ Linder, Bernard (October 1968). "Independent Subway Service History". New York Division Bulletin. Electric Railroaders' Association. ^ "Changes Set for Jan. 2 Praised" (PDF). The New York Times. November 25, 1972. Retrieved January 25, 2016. ^ "Service Adjustments on the BMT and IND Lines Effective Midnight, Saturday, August 27". Flickr. New York City Transit Authority. 1977. Retrieved June 9, 2016. ^ "A Subway Timetable" (PDF). mta.info. ^ "October 1992 New York City Subway Map". Flickr. New York City Transit Authority. October 1992. Retrieved October 7, 2018. ^ "H Train". stationreporter.net. Archived from the original on January 3, 2005. ^ Chan, Sewell (January 25, 2005). "2 Subway Lines Crippled by Fire; Long Repair Seen". The New York Times. ISSN 0362-4331. Retrieved October 23, 2016. ^ "Remembering a fire at Chambers St". Second Ave. Sagas. ^ "Rebuilding the Rockaways After Hurricane Sandy". mta.info. Metropolitan Transportation Authority. Archived from the original on November 29, 2012. Retrieved November 18, 2012. ^ "MTA on Twitter". Twitter. ^ "Train Change: A/ Shuttle Service to be Impacted Starting in April". THE ROCKAWAY TIMES - First and Free. March 8, 2018. Retrieved March 30, 2018. ^ Cohen, Billie (January 2, 2008). "The A Train". The New York Times. Retrieved October 14, 2015. Wikimedia Commons has media related to A (New York City Subway service). "A Subway Timetable, Effective June 24, 2018" (PDF). Metropolitan Transportation Authority. Retrieved June 24, 2018.